TAIHEY! is a real magician from Japan and learned magic in America. He is a member of JPMA(Japan Professional Magicians Association) since 2008. When he was 13 years old, he succeeded his first stage show in the public hall which admits 1,600 people in Aichi prefecture, Japan. 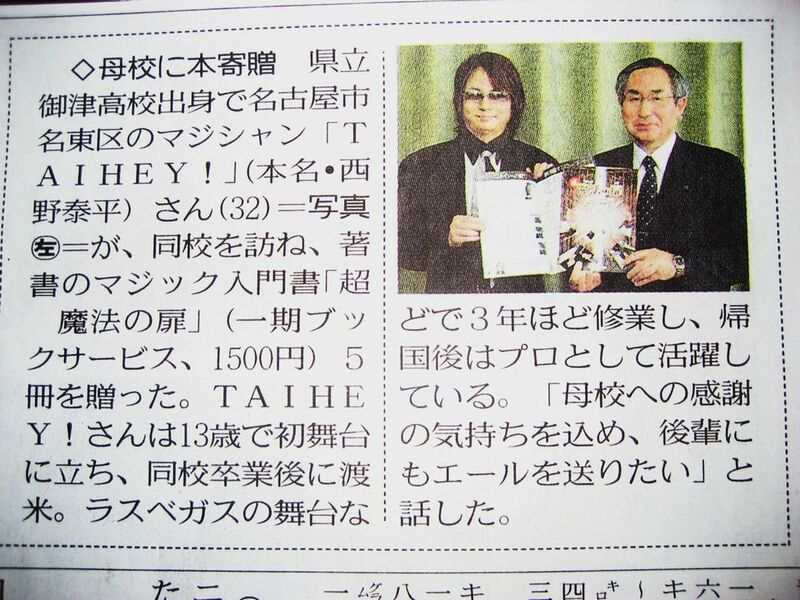 TAIHEY! embarked to America to study and perfect his magic skills in 1994. He returned to America a second time, to perform on a 3 month tour to Los Angeles, California and Las Vegas, Nevada in 1995. 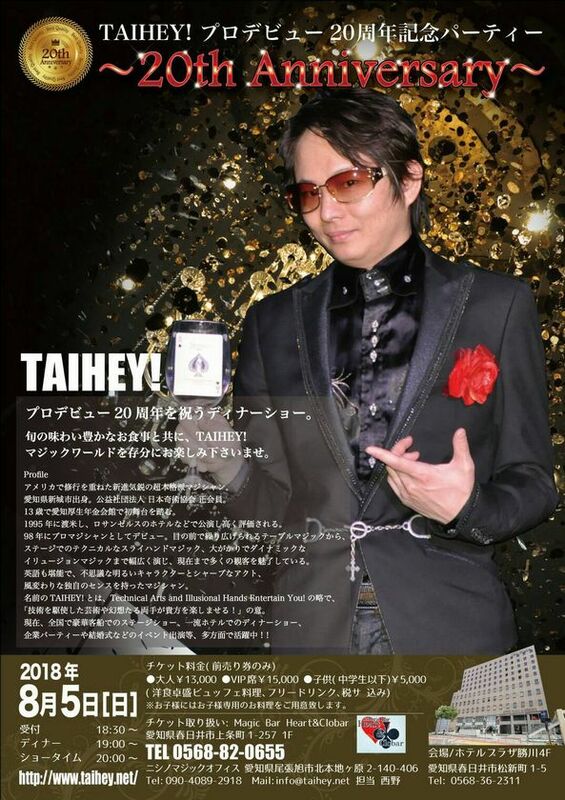 In 1998, he began touring Japan as a fulltime professional magician and he made his first national television debut in Japan at the age of 20. TAIHEY! is a marvelous and attractive magician who has a bright and charming character, sharp magical acts and special keen sense of magic. TAIHEY! is available to perform for large or small audiences, such as illusion magic, stage magic, salon magic and close-up magic. He specializes in “Super Creative Magic” using cards, coins and live doves, and his repertory has over 3,000 tricks. 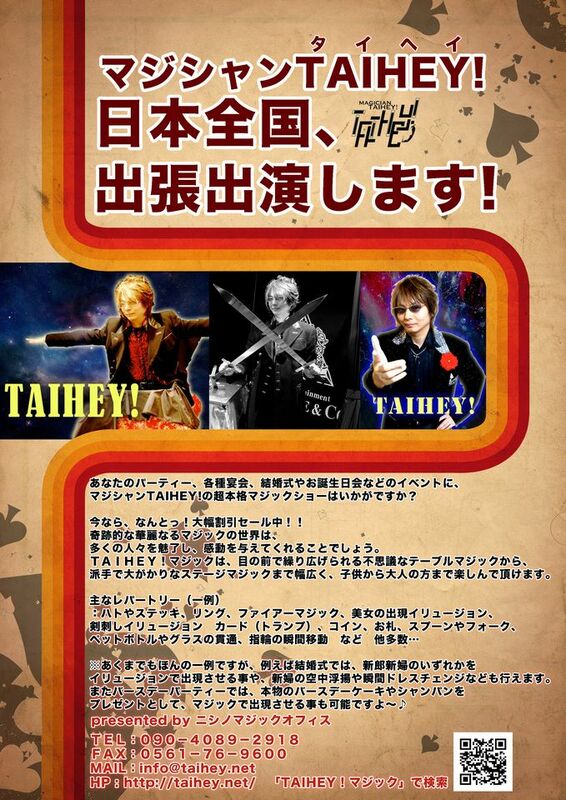 The name of “TAIHEY!” stands for “Technical Arts and Illusional Hands Entertain You!”. Now, TAIHEY! is active on TV shows, dinner shows in gorgeous hotels, his original magic lives, weddings or business parties etc. all around in Japan. Copyright (C) TAIHEY! All Rights Reserved.